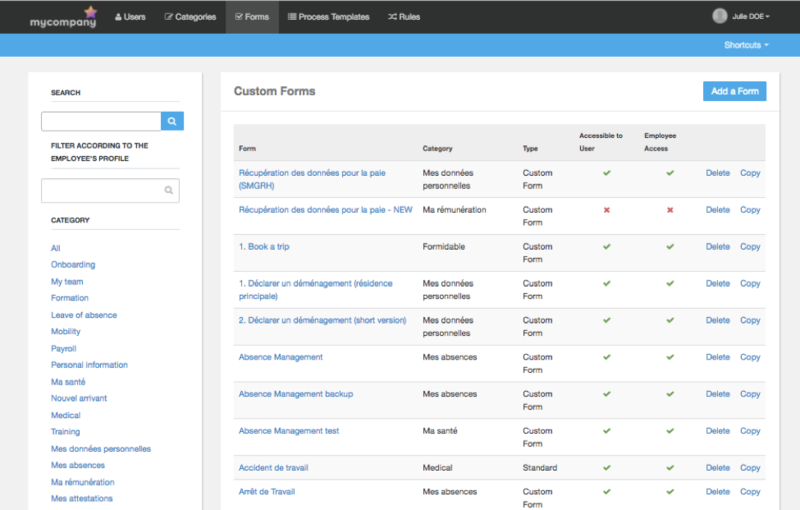 As you may recall, we announced our new Formbuilder back in the March release. We rebuilt the Formbuilder so that we could add more complex capabilities, such as dynamic fields and logic. With the August release, you can now duplicate a form in Case Management and Process Automation! You can now copy forms and then edit the copy as needed. Form duplication has many uses, some of which are obvious, but others may not be. Different forms for different employee groups. Perhaps you have some forms that require an extra field or two if the employee is full-time vs part-time. Or maybe you have forms that ask an extra question if the employee has a certain level of seniority. Duplicating the form will eliminate several steps in order to create these similar forms, saving you valuable time. Forms by geography. Do you have standard forms that have slight variations from geography to geography? Start by creating a master version - potentially with your most complex geography - then simply copy and update the geo requirements as needed. List management. We’ve heard that it can be challenging to recreate the same field over and over in multiple forms - for example, a list of all the countries where you have employees or a list of the 50 United States. If there are fields you use in almost every form, you can create these as a template. Then just duplicate that form when you begin to create a new form, and you won’t have to go through the process of selecting all 50 states or all of your countries again!